After creating a card set you can create new tabs. 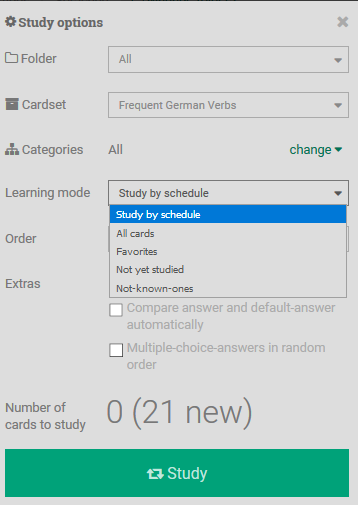 For this you click on "new cards" or "several new ones"
Deleted flashcards can be restored via the filter function. For this you just have to select the filter "trash" and you will see the flashcards that you have deleted from the set of cards once. Then you can select the flashcards you would like to restore. 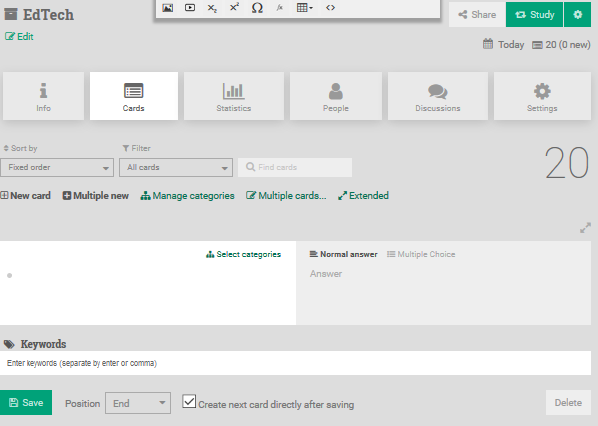 To be able to edit several cards at the same time click on the menu item "Multiple cards...". After that, various options for editing multiple cards will appear. These include: Move to trash, activate, deactivate, copy, move, assign to a category, etc. You can tag single or multiple cards with a keyword. You can either do this directly when creating the flashcards. 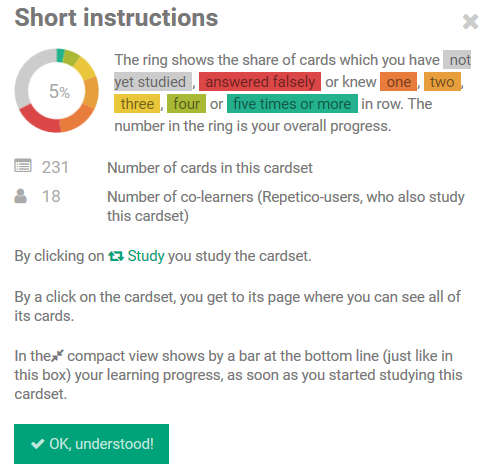 Under each flashcard you will find an input bar in which you can enter keywords. But a subsequent addition of keywords is possible via the editing function. To do this, click on "Several new ...", then select the desired tabs and then click on "Assign categories / keywords. Then you enter the desired keywords and then click on confirm. - The final input of keywords is achieved by using the Enter key! - Entering keywords is currently only available through our web version! You can also add a comment to each card. For this you must open the flashcard and then see a comment field below. In study mode you do not see these comments. For this you go to the desired set of cards, then click on the button "several cards", then select the cards to be moved and finally click on "move". You can also add pictures, videos or GIFS to your flashcards. For this you can use our editor (see screenshot) or add the media via drag and drop or copy-paste function. To create your own set of cards, you first click on the menu item "Card Sets" and then on the button "New card set" in the top right corner. Who can see and learn the cards? Only me, if necessary, other selected users: Only you and individually selected users can see your set of cards and learning. Is it possible to apply for learning? Yes: Other Repetico users or friends can apply to join. No: Other Repetico users or friends can not apply to join. Who may invite and accept users? Who is allowed to edit cards? Only the creator of the file and possibly moderators: Only you and moderators selected by you may edit the cards. Who is allowed to add cards? Only the creator of the cardset and possibly moderators: Only the creator and possibly presenters may add tabs to the set of cards or create new ones. All co-learners: All learners may add tabs to the set of cards or create new ones. 2.4. How do I make a co-learner a moderator? You can switch a co-learner into a moderator by clicking the menu item "people" within a cardset and then click on "Manage co-learners". There you can appoint fellow learners to moderator but also ban on learning. 2.5. How can I delete someone as a co-learner? You deprive the approval of learning from co-learners by clicking on the menu "people" and then click on your "manage co-learners". There you can ban co-learners from learning. Restoring deleted cardsets is currently not possible. We would therefore ask you to deactivate the cardsets rather than deleting them directly. Or you make a backup an export, so you can restore the cardsets by yourself. Creating cardsets (depending on the number) means manual effort for us and because of the high workload we cannot guarantee that the restoration will take place at the time you want it. We ask for your understanding in this regard. You can delete a deck of cards under the cardset settings. To get into the settings, you first click on your set of cards. Then you click on the menu item “settings”. In the last tile on the left you can then delete your card set. Repetico offers you both an import and an export function. You can e.g. save an excel spreadsheet (2 columns consisting of 1st column = question and 2nd column = answer) in CSV format and import them. It is also possible to print, export as a Word document, HTML or PDF. These functions are only available for self-generated flashcards. PS: Pictures cannot be imported. You can also lead a cardset-related discussion. To do this, click on the desired set of cards and then on the category "discussions". If you want to have your cards read out in the appropriate language, you can set this directly when creating the card set or set it later. For this you go to the respective set of cards, then to settings and set under the menu item speech output your desired language for the speech output. Repetico allows you to invite your friends and study group partners so that you can create flashcards with you. Just click on the "Share" button and invite your friends via email address or username. Repetico allows you to invite your friends and study group partners so that you can create flashcards with you. Just invite people and invite your friends to join in! Purchased card sets contain copyrighted content from authors, which cannot be shared because of copyright, but are recommended for sale to others. For this you click on the desired set of cards, then on the point "recommend card set and be rewarded" and enter the email address or username. You can easily share your own created card sets with the "Share" button on the top right. There you have the possibility to share it with Repetico users, social networks or embed them with the specified HTML code. 2.15. What do the individual colors in the circle next to the card set mean? 4. Where can I find existing index cards of other users? 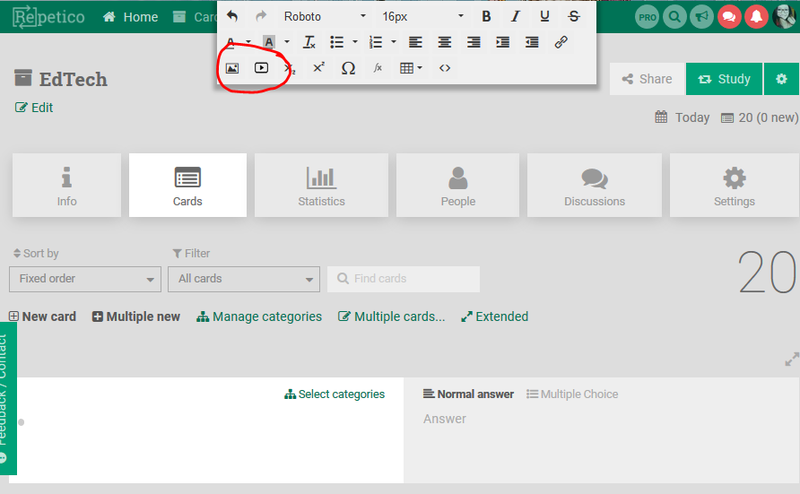 To find freely available card sets of other users, click on the search field or the magnifying glass icon on the top right and indicate your desired topic after you search. 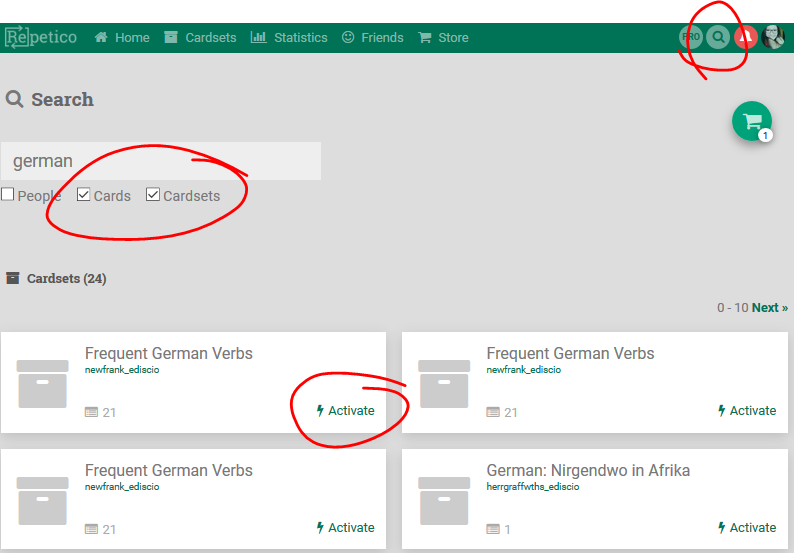 After entering you can then select from a list the set of cards that you want to learn by clicking on the green button "Learn" (top right) or directly on activate. When searching, make sure that you have activated the filter on "Cards" or "Card Sets". 5.1. How does the learning point system work? What are learning points: Learning points are an indicator of how diligently you learn. Decisive here is the regularity of your learning and not the mere quantity of learning material. You will receive learning points each day on which you learn at least 10 index cards. The more days you learn in a row, the more learning points you get for the day. Starting with 10 to a maximum of 15 learning points. 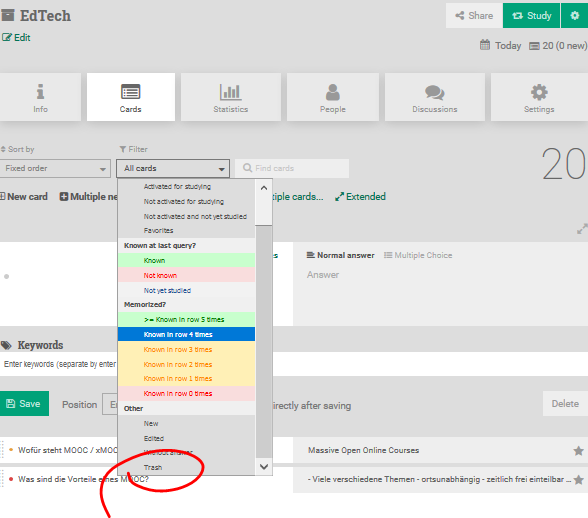 You will see the learning points on the start page of your learning plan, as well as on your profile and on the learning points page. 5.2. My learning points have not been assigned - what can I do? In this case, please contact [email protected] directly and add the username to your mail. Limit to keywords: Here you can limit the query to cards that you have provided with specific keywords.